Carry-All Haul'n Cruiser- Load It Up & Go! Waveony (Wave-on-y) carts are the only carts that allow our customers to fold the loaded cart and carry it like a shopping tote. This patent pending feature saves time and greatly simplifies transitioning from wheeling our carts to driving or using public transportation. There is no need to unpack, fold and carry your cart and a multitude of shopping bags. Simply fold your cart, grab the tote handles and place the loaded cart in the trunk or on public transportation. Please see our videos to see the carts in action. As illustrated it takes less than 10 seconds – no hassle and a real time saver! 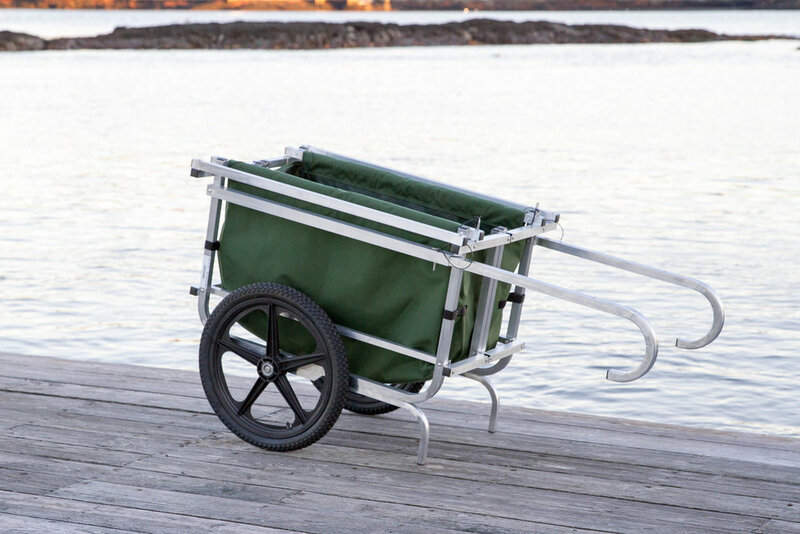 Our patent pending designs place cart handles outside of the wheels. This allows our carts to be used like rolling luggage without your heels constantly contacting the cart while walking. When walking down a ramp or down grades, please walk with the cart in front of you. For a heavily loaded cart extending both handles and wheeling the cart in front is recommended for safety. Distinguishing between light and heavy loads depends on each individual’s comfort level, if there is any question with a particular load we recommend using both handles. Remember Safety First for you and those around you. Waveony carts use shear pins versus the standard quick snap handles. Quick snap handles are effective in new carts but overtime, particularly in the marine environment, galvanic corrosion between the steel and aluminum reduces the diameter of the hole. In addition salt crystals, sand and other fine particulate matter reduces pin motion. If the cart is stowed on a yacht for six months of the year, these pins are typically corroded shut. At Waveony safety is of utmost importance. If a corroded quick snap handle prevents a pin from fully engaging while using a heavily loaded competitor’s cart, one endangers the health of the user, children & adults nearby and can result in property damage. For these reasons Waveony carts use shear pins. These take a second longer to use but they guarantee each handle is locked and will provide decades of maintenance free use. There are four shear pins that lock the rotating handles as explained in cart directions. For light loads only two of the four shear pins need to be used. For heavy loads all four shear pins need to be used. Please refer to your cart’s directions, as the load limit changes with cart model. Carts can be damaged in a number of ways, such as getting caught between a hull and dock or hit by a car. If this happens email us pictures of your damaged cart. We can quickly assess the damage, identify components that need to be replaced and often have these parts sent out the same day. We will include specific instructions to repair your cart. If you prefer, you can ship the cart to us and we can perform the repairs for you.